In a new paper*, Michael Woodford has reimagined the famous “Schroedinger’s Cat” thought experiment. I suspect this is unintentional. But that’s what happens when, in an understandable quest for simplicity, you create binary decisions in a complex probability-based structure. Schroedinger imagined a cat locked in a box in which there is a phial of poison. The probability of the cat being dead when the box is opened is less than 100% (since some cats are tough). So if p is the probability of the cat being dead, 1-p is the probability of it being alive. The problem is that until the box is opened, we do not know if the cat is alive or dead. 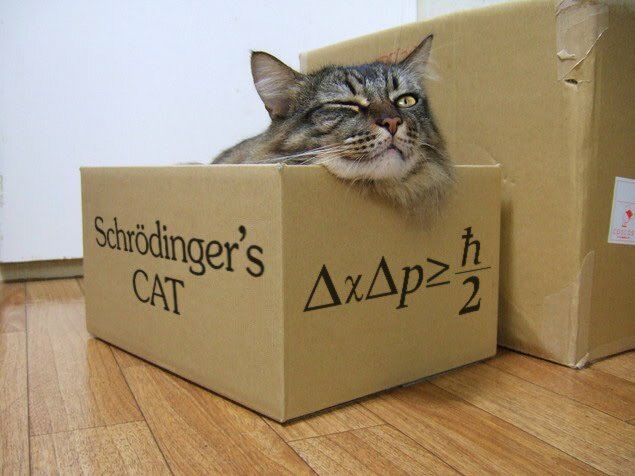 In Schroedinger’s universe of probabilities, the cat is both “alive” and “dead” until the box is opened, when one of the possible outcomes is crystallised. The sequence of events, and the set of alternative states that may be reached, within each period is indicated in Figure 1. In subperiod 1, a ﬁnancial market is open in which bankers issue short-term safe liabilities and acquire risky durables, and households decide on the cash balances to hold for use by the shopper.8 In subperiod 2, information is revealed about the possibility that the durable goods purchased by the banks will prove to be valueless. 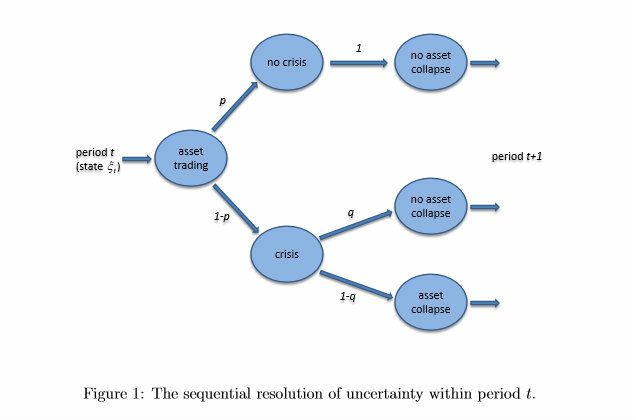 With probability p, the “no crisis” state is reached, in which it is known with certainty that the no collapse in the value of the assets will occur, but with probability 1−p, a “crisis” state is reached, in which it is understood to be possible (though not yet certain) that the assets will prove to be worthless. Finally, in subperiod 3, the value of the risky durables is learned. The binary forks are clear. Either there is a crisis, or there is not. If there is a crisis, either assets collapse or they do not, and until either the asset collapse happens or the crisis is over we do not know which it will be. To keep things simple, Woodford also assumes that asset collapse after a crisis renders assets worthless. The reality in most cases is not so extreme, of course, but hey, why destroy a perfectly good binary argument with unhelpful facts. So, following Schroedinger, we can say that until one of the two possible outcomes is crystallised, our assets are both worthless and valuable. But Woodford thinks investors can’t cope with such uncertainty. Faced with a probability 0.5<q<1 that the value of their assets will collapse, rational investors will sell. So whereas the patient Schroedinger waits to open his box, and presumably only cremates the cat if it is dead, impatient investors cremate the box with the cat – whether dead or alive - inside. This changes a probability of perhaps 60% that there will be an asset collapse into a dead cert, since if all investors sell, the value of the assets falls to zero. Investors’ rational decision not to accept the risk of total loss resolves uncertainty in a way that ensures the majority of them lose. It’s the madness of crowds. The economic consequences of panicky investors all selling assets at once can be extremely serious. Sharply falling asset prices quickly bankrupt financial institutions, corporations and households, while impaired collateral values disrupt funding, causing a sudden stop in financial flows. So what is Woodford’s solution? Step forward, central banks. Woodford’s big idea is that central banks should resolve the uncertainty by buying the risky cat box and replacing it with their own breed of risk-free cat. We replace the certainty of asset price collapse with the certainty of no collapse. Schroedinger’s cat is alive and well. But what on earth is new about this? We have known for years that central banks can support asset prices. It is the main benefit of quantitative easing. When a central bank credibly stands as buyer of last resort for a given asset class (JGBs, anyone? ), it effectively sets the price – to the annoyance of those who would really like to make money from shorting those assets. Central banks cannot prevent their own currencies from collapsing, but they can prevent the value of any asset denominated in their own currency from falling. This is pretty basic and doesn’t need a very long paper and lots of complicated mathematics to explain it. But Woodford’s intention is not simply to remove the possibility of asset price collapse after a crisis. It is to remove the possibility at all times. He wants to wipe out both the second AND the first binary fork in his diagram. Specifically, central banks should provide sufficient public sector safe assets to eliminate the possibility of the private sector creating things that it calls “safe assets” which can turn out to be anything but safe. So not only should the cat not be cremated while still in its box, it should not be put in the box in the first place. There is nothing new about this idea, either. Gary Gorton (whom Woodford cites) has been saying for years that the private sector cannot create genuinely safe assets. And back in 2012, BIS produced a paper arguing that governments in good standing (by which it meant reserve currency issuers, particularly the US) should issue sufficient safe assets to meet demand. BIS did not specify what it meant by safe assets: but Poszar defined them as cash and various varieties of short-term government debt (such as Treasury bills). Woodford follows Poszar in regarding these as as equivalent to cash. 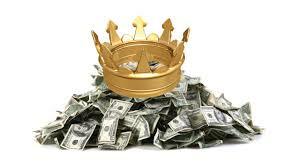 Widening the definition of “cash” to include short-term government debt securities as well as currency and reserves eliminates an obvious criticism of any proposal to replace “safe assets” with cash. Reserves are only available to regulated banks, while physical currency is inconvenient in large quantities. But non-banks need safe assets too. Pozsar explains that a shortage of public sector safe assets for non-banks contributed to excessive production of private sector “safe assets” prior to the 2007-8 financial crisis. And this is the heart of Woodford’s paper. He thinks he can dismantle the US banks’ securitisation engine by removing the incentive for them to fund themselves by issuing short-term asset-backed securities. If the central bank floods the place with short-term liquid government securities, demand for bank-issued “safe assets” will collapse, banks will stop funding themselves by issuing the things and there will never be another 2008. Of course, there would have to be a large increase in the supply of short-term liquid government securities. This has significant implications for fiscal finances. Short-term they may be, but T-bills are still debt. So to accommodate the demand for T-bills, either the US government would have to increase the total amount of US government debt in circulation, or it would have to fund itself primarily with very short-term debt. But governments funding themselves largely with very short-term debt suffer interest rate risk. Normally, the only governments funding themselves in this way are in distress. And there remain question marks over the effect of very high debt/gdp levels on growth and welfare. BIS's idea that government should issue far more debt but ensure its future safety by permanently running primary surpluses shows an incredible naivety about the political process. How could a democratically-elected government possibly maintain continual austerity while storing up the proceeds from unprecedented levels of public debt issuance? Such blatant favouring of the demands of the financial system over the needs of its population would seriously raise political risk. So there is a conundrum. To meet demand for safe liquid assets, the US government must shorten the average duration of its own debt. But doing so raises its risk, hence making its debt less "safe". How to resolve this problem? This brings us to Woodford’s REALLY big idea. The Operation Twist variant of QE shortens the duration of government securities held by the private sector. So the US government can still fund itself with long-term debt, but much of this would be exchanged by the Fed for T-bills (Operation Twist) or monetary base (QE). The T-bills would of course also be issued by the US government, so the nominal amount of US debt would increase significantly. But because the majority of long-term debt would be held by the Fed, the amount of US debt held by the private sector would not significantly increase. Only its composition would change. And of course the Fed controls short-term interest rates, so interest rate risk on such short-term funding of government spending would be neutralised. What's not to like? Woodford’s scheme is consistent with BIS’s argument that the central bank should routinely monetise its own government’s debt in order to control the price. Safe assets have to remain safe, after all. Now, as a cat lover, I am all in favour of not cremating cats until we know for certain they are dead. But why deprive cats of the boxes that they love, simply because not all cats are immune to poison? And why create a special breed of cat that is immune to poison? Why not remove the poison? This, to my mind, is a serious weakness in Woodford's paper. He makes no attempt to identify what the poison is. What is it that kills the cat? Recall that, prior to 2008, the supposedly safe private sector assets were mispriced. They were believed to be safer than they turned out to be, and when the nakedness of the emperor was disclosed for all the world to see, their value crashed. But why were they believed to be safe? Lowering the equilibrium return on risky investments (such as the “durable goods” modeled here, which one may think of as housing) by lowering the return on safe assets works only insofar as the increased spread between the two returns that would result if the return on risky investments did not also fall increases the incentive to ﬁnance additional risky investment by issuing safe liabilities, thus increasing the leverage of the banks and the degree to which they engage in liquidity transformation; this results in a reduced equilibrium return on risky investment, but not by enough to fully eliminate the increased spread that induces banks to issue additional safe asset-backed liabilities. I'm afraid this is a serious error. Housing is not thought of as a risky investment. It was - and still is - believed to be safe. This is the poison that kills the cat. And it was put in the box by Franklin D. Roosevelt back in 1934. The National Housing Act established the principle of persistent government support of the housing market - a principle that was extended and developed by subsequent governments, often to prevent property market collapses. For example, the Savings & Loan crisis of the 1980s resulted in further federal and state guarantees for mortgage lending and bailout of institutions that had bought mortgage-backed securities. By the end of the 20th century, the US mortgage market was the most government-controlled in the world and property prices had been protected from significant falls for seventy years. No wonder people believed that property was a safe investment. So the securities issued by banks were "safe" because they were backed by safe physical assets. They collapsed because those safe physical assets turned out not to be safe. Nor is this the only time this has happened. Indeed, the National Housing Act itself came about because of the terrible property market crash in the Great Depression, in which real estate prices fell by 30%. The use of securitization came out of the Great Depression. Prior to the Great Depression, local banks largely served their communities, and if the local community suffered an economic shock—like an employer going out of business or a weather-related problem—the entire bank’s customer base would have problems all at once. This put undue risk on the bank but also left the community with no source of credit if the bank started having problems. Securitization allowed lenders from outside the area to provide capital to borrowers within the community. It also allowed the local bank to lay off some of its geographic risk. In short, securitisation was believed to make the financial system more stable. Nor has Woodford thought about the economic consequences of dismantling the mortgage securitisation engine. Removing the incentive for securitisation is presumably intended to force banks to keep mortgages on their balance sheets. In combination with macroprudential regulation (which Woodford suggests should be used in conjunction with QE), this would be likely to cause a considerable reduction in mortgage origination. How long would it be before a desperate government looked for ways of circumventing this restriction in order to stimulate the property market in the interests of improving economic growth? How long before the Fed trod the path that the Bank of England laid with its "funding for lending" scheme, accepting mortgage loans in return for short-term government debt to enable banks to reduce their cost of funds and thus increase mortgage lending? For over seventy years, the combination of government intervention and a liquidity transformation engine (for that is what securitisation is, in the US) created the illusion that property prices could never fall. But no government can entirely insulate markets from shocks: and the securitisation engine, far from dispersing risk safely, in fact concentrated it. The crash, when it came, was made far worse by the deliberately fostered belief that real estate was a safe investment. Now Woodford calls for for permanent government intervention in financial markets, and for routine use of liquidity transformation to reduce risk. Like this worked so well last time. But why should financial markets be protected from shocks? Why should governments preserve the illusion of safety by creating "safe assets" purely for the use of the financial industry, regardless of the needs of their population? In short, why should we continue to put poison in the boxes that cats love to sit in? There is no such thing as a safe asset. The idea that any asset is, or can be made, completely safe, is dangerous folly. Financial markets must learn to price risk correctly and manage it appropriately. Until they do, they will continue to put the whole of society at risk. Have we done enough to prevent another crisis? Brad Delong's take on Woodford's paper is here. * I'm very sorry about the paywall. Academic publishing, meh. I have quoted the bits of Woodford's paper that I think are relevant to my argument. Brad Delong has done likewise. "Schroedinger imagined a cat locked in a box in which there is a phial of poison." Also a radioactive source which detects radioactivity and shatters the flask if it does so and kills the cat. True. Schroedinger's thought experiment had only one binary fork, not two. If I translated it into Woodford-speak, crisis would always result in asset collapse. Eh, it's important if, like Schroedinger, you want to criticize the Copenhagen interpretation. I think that, for the purposes of this metaphor, "some cats are tough" is a reasonable abstraction. If you are going to imagine a system of economics then imagine one in which there are no financial markets, and there is no debt. There are assets and they have value that can fluctuate, but all asset holders are insured against financial catastrophe should the assets falter. The endless theorizing about what we can do within our current financial and government structures in order to build better lives for the people is very depressing and has little chance of success. The current systems cannot be improved enough to save us from ourselves. They must be replaced. I really would love to see your design of a new national economic system for the the UK and the US instead of spending so much intellectual energy on cats in the box. Oops, sorry, you probably have already designed such systems. If, so, thanks, and please give me the link. The main thought experiment you have failed to include is the fact that we don't exist at all thus you are filling up the internet with a load of waffle when it could be better used on more important topics like how lucky we are to think we are alive. 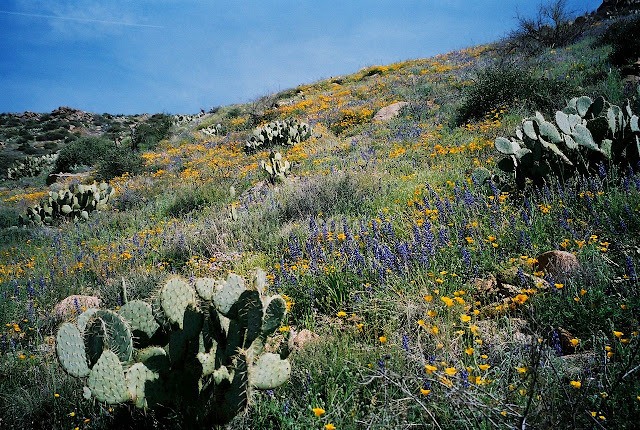 "There is no such thing as a safe asset. The idea that any asset is, or can be made, completely safe, is dangerous folly. Financial markets must learn to price risk correctly and manage it appropriately. Until they do, they will continue to put the whole of society at risk." You left out crime and fraud ie there is no house. Interesting conclusions, but I'm unsure about your history. Much of the psychology of property as safe assets is less about interventions - there have been many property bubbles burst over the years since WW2, even in the USA - and more about the history of the last 30 years or so. Ironically, even S&L is probably out of psychological distance. I don't think so AMEX-there is a reality that does not seem to set in within the Commercial Banking Industry, it is the very nature of it's no regulation and connection that makes it attractive for one aspect public interest-no governmental connection at all. Second, it is anonymity that appeals not only to less savory, but those who like to maintain a sense of control over their own "world." 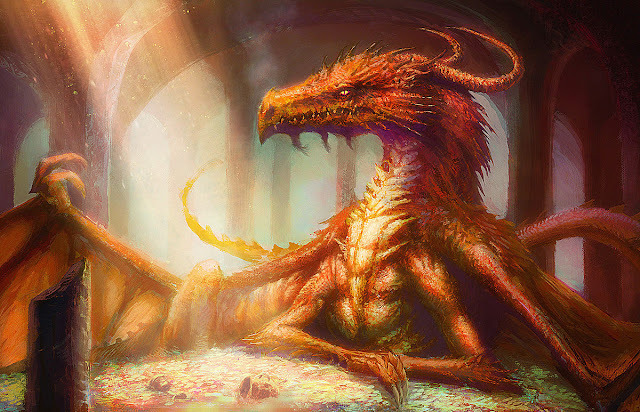 It is the Central Banks, Banking, Taxation and Governance go Free Association that is arcane and no longer helpful or productive for a global economy. I have suggested that the US needs to introduce the elimination of the Fed along with the introduction of three types of currencies. The first would be a truly anonymous crypto currency following rules that make it a valuable asset class. The US Treasury should include a micro transaction tax and distribute processing as occurs with Bitcoin Blockchain. This currency would be managed from a resource standpoint for high speed processing this would make this digital currency of interest to a broader range of individuals and institutions for both a perceived safety and a transaction reliability standpoint. The second would be the transactional currency of government and it would not be anonymous entirely and include many of the features of above. This would be the currency of government activity and economy productivity and structured as such, but would not be so designed to be controlled and manipulated as the Federal Reserve does today and follow a specifically design functional structure. Finally, the their would be a currency tied to the value of individual out put and creation. This would make this a barter currency in a sense and a currency that could be used as a vehicle for securing "loan" in one sense as well as certain investment. In any traditional sense this would not be currency as we think of it but a vehicle that replaces many banking functions. It would be also a vehicle were exchange could be made using crowd funding or other developing vehicles in a managed by design process. My own thinking is that we could have a base of "currency" that could replace a lot of the banking function we know today and provide a better and more stable platform for investment in corporate stocks, product/service development or some other contractural arrangement. All managed within the context of the blockchain for all of the units of currency, but also contracts, fulfillments and renewals. ALL OF THESE CENTRAL BANK/TRADITIONAL BANKING REPLACEMENTS INCREASE EFFICIENCY AND BUILD THE MODEL FOR TAXATION THAT IS MORE "REALTIME TRANSACTIONAL," HOWEVER THAT WOULD BE DEFINED. This is a shift in thinking that is entirely disruptive, but rapidly able to be deployed and operational. There is much more that needs to be fleshed out in a fully descriptive paper on the subject, but give the disruptive nature of the elections now taking place in the US there just may be that chance to do something truly novel. IT WOULD NOT SPELL THE END OF BITCOIN, BUT ENHANCE AND FURTHER LEGITIMIZE IT AS ANOTHER CURRENCY NOT ALIGNED WITH ANY POLITICAL ENTITY. Would not the easiest solution to Woodford's problem be to close all private banks and make them public?